The major in Bible and Theology is designed to provide an understanding of the Bible, history of Christian thought, and theological doctrines. It provides excellent preparation for students who desire to pursue graduate studies in a seminary or university. Both female and male students following God’s call to missionary service, pastoral leadership, preaching, and teaching are encouraged to pursue this major. Why study Bible & Theology at Malone? Much of your learning will be hands-on experience through a church or para-church setting. Many of our professors come from a variety of Christian faith traditions. You'll study and hopefully gain an appreciation for a wide variety of denominations and worship styles. You’ll have the chance to plan your own events, such as retreats, camps, and youth conferences. Each year, students preach in community worship and have numerous opportunities for experiential ministry. The Bible & Theology major curriculum is listed in the official Academic Catalog. Students who are majoring in another program may choose to take a Bible minor or Theology minor in addition to their primary course of study. A minor normally consists of a minimum of 15 semester hours, six of which must be taken at the 300/400 level. Each academic school or department must approve the student and curriculum to be used in the completion of each minor for the Office of the Registrar to verify at the point of graduation. 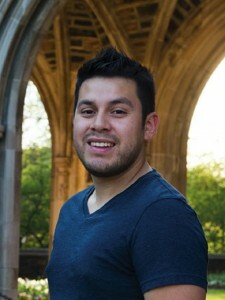 After graduating from Malone, Gabe enrolled at Duke Divinity School, where he is pursuing his M.Div. degree. He has a ministry tutoring Hispanic children struggling with the English language barrier.